With some down time around the holidays and new year, I've decided to do some statistical analysis involving our beloved Cavaliers. Perhaps because I'm from Cleveland and need to pinch myself to prove the 26-5 start is for real... or because I'm tired of the local naysayers who tell me the Cavs haven't played anyone... or because all we hear from ESPN is how they should start printing the Boston Celtics NBA Finals tickets already... for whatever reason, I wanted to take a more in-depth look at the Cavs schedule so far this season in comparison to the agonizingly vaunted Boston Celtics. 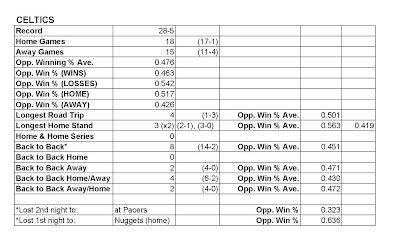 I decided to look at who each team played, if it was home or away, the wins and losses for each of those games, and the winning percentage for each team. With that data, I was able to compare various stats to get an idea of how strong (or weak) the schedule has been and unearth some interesting details. I admit I'm no statistician or mathematician... nor an Excel expert (which I dropped the data into to calculate the averages) so I'm sorry if there are any errors. 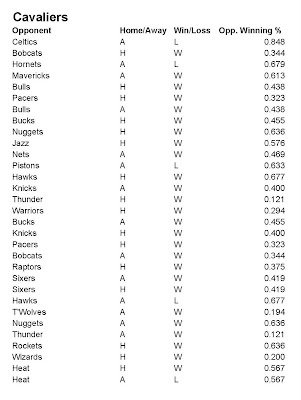 In looking at the details, one might say it is splitting hairs, and well, yes it is... the teams have the same amount of losses, with the Celtics having two more wins. But it is in these details you can see certain nuances. For example, the Celts opponents do have a higher average winning percentage (.476 to the Cavs' .461), but the Celts have played two more home games (and two more games overall.. the two teams have played the same amount of away games). Speaking of away games, the Cavs opponents in those away games have a higher winning percentage than the Celts', while the Celts' home opponents are higher. (Most people would agree it is generally harder to play away games in most sports... unless you are the Cleveland Browns... so the fact that the Cavs played "better" away opponents may say something). Another little nuance that I noticed is that the Cavs have played two home and home series (which I feel is generally tough being you have to beat a team two games in a row), one recently against the impressively energetic and young Miami Heat. One series (against the Sixers) they played away, then home. Against the Heat it was reversed. They are 3-1. The Celts? They haven't played any home and homes yet. Another detail I looked at was back to backs... and more telling... back to backs on the road, home then away, and away then home. 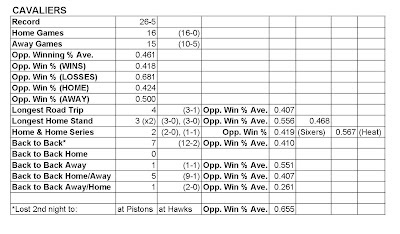 Two of the Cavs losses on back to backs were BOTH the second night AND on the road at two very good teams... the Pistons and the Hawks. 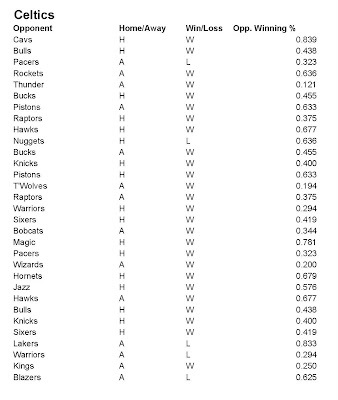 Again, it seems like splitting hairs, but looking at how close the records are, those two losses are important. The Celtics lost AT HOME the first night of the back to back to the Nuggets (a team the Cavs swept already) and the Pacers. Basically, the conclusion I made is what I had figured before I did this... after 30+ games, there is no such thing as "not playing anyone". While the Cavs opponents overall have a worse winning percentage than the Celtics', I believe nuances within the Cavs schedule have evened that out, including a tough 4 games in 5 nights in which they went 3-1. And let's not forget that one of the Celtics' wins (and conversely one of the Cavs' losses) was opening night in Boston against the Cavs. With the ring ceremony and subsequent crying act by the NBA's resident Oscar winner Paul Pierce, the Cavs had basically no chance of winning opening night. I'm not sure if the Cavs are better than the Celtics... man for man (at least starting lineup) they probably aren't. But we took Boston to the final minute of Game 7 last year with Lebron having a HISTORICALLY bad series (and missing a layup in Game 1 for the win), blowing a huge lead, Boobie getting hurt, a team that had only played 30 games together after most of the starting lineup was traded, and no Mo Williams. This year we haven't played that many good teams because we ARE that dominant team that makes everyone else look bad. Below are graphics of the summaries for each team, followed by each schedule with opponent, home or away, and opponent winning percentage.